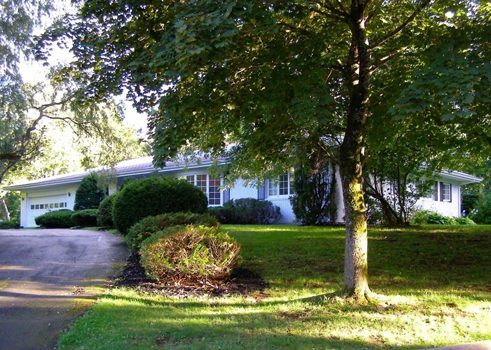 In their red and white bungalow at the end of Lynhaven Street in one of Fredericton’s prettiest neighbourhoods, gallery owners Ingrid and Peter Mueller display their artwork collection from New Brunswick’s and the Atlantic provinces’ best artists. The couple’s spacious house functions as a gallery, which opens by appointment. Outside of vernissages, art lovers can enjoy and purchase art undisturbed. Upon arrival at the modern house, which was built in the mid-60s, visitors are greeted by Ingrid Mueller. Then, they can choose to take a guided tour of the exhibition through the house with its interesting architectural design, or they can wander alone through the bright rooms full of paintings, drawings, sculptures, ceramics, and photographs. Depending on the exhibition, the gallery displays works by both established artists and new, young, talented ones. The pieces range from representational to abstract, from portraiture to landscape, and from the subject of color to artisan craftwork. The couple is guided by international standards and they prize having top artists from eastern Canada in their collection. Together with her husband, Ingrid Mueller has been enriching Fredericton’s art scene for around 20 years. Before deciding to open up her collection to the public in her own home, Mrs. Mueller set up her gallery in various places around Fredericton, as well as exhibiting artworks in public locations like restaurants and the Fredericton Convention Centre. She also curated several bigger exhibitions, such as the Marion McCain exhibition for the Beaverbrook Gallery. Furthermore, Ingrid Mueller was a special guest at three large exhibitions in Germany involving Atlantic Art: “Transit-Atlantic Crossings” at the Galerie Schloss Mochental in Ehingen; an exhibition at Deutsche Werkstätten Hellerau in Dresden; and a display in the 2006 Karlsruhe International Art Fair. Together with “The Entrepreneur Academy”, Ingrid Mueller leads workshops for artists, offers artist consultations, and advises those interested in an artistic career. She considers alternative exhibition spaces, cooperation between artists, and exchange and critique to be important requirements for artistic inspiration. It is therefore no accident that the city of Fredericton chose the art expert as a board member for “Ignite Fredericton”, the city’s initiative for modernizing public and private structures. Ingrid Mueller (or the “Peggy Guggenheim of New Brunswick”, as some call her) and her husband Peter contribute even more to the area than their patronage of eastern Canadian art and professional development opportunities for the new artistic generation. For example, Peter has conceived of a construction project to create eco-friendly housing for the elderly along the idyllic Saint John River. 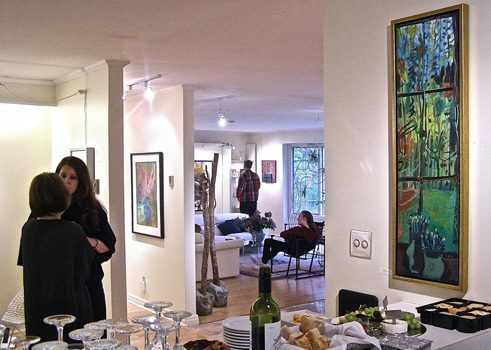 In 1997, when the couple were looking for a suitable home for themselves and their artworks, they decided on Fredericton. Not only had New Brunswick’s then premier, Frank McKenna, extended an invitation to the province through the media to investors and companies, but Fredericton also promised a fruitful creative and intellectual environment. It is the home of a number of artistic organizations, such as the Beaverbrook Gallery, along with the postsecondary institutions St. Thomas University, the University of New Brunswick, and the New Brunswick College of Craft and Design. Peter comes from the Lübeck area in Germany, while Ingrid’s parents originally came from Karlsruhe and Koblenz, and then immigrated to Canada in the 50s. The couple met in a gallery in Freiburg in southern Germany. Ingrid, who had been born in Oakville, Ontario, managed a private English school for business people there. She had a degree in German Studies, but also loved art. Peter was successfully employed as an architect, and was visiting the gallery because of his passion for art collecting. The two are still connected to this day by their shared interest in modern art, good taste, creativity, and joy in innovative thought.